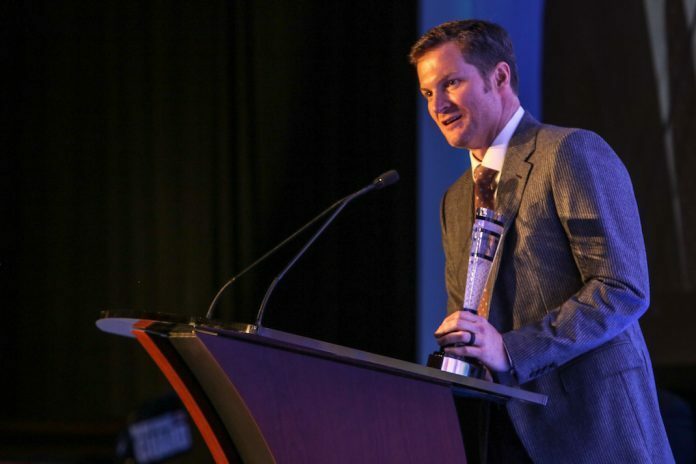 North Carolina Motorsports Association Honors Dale Earnhardt Jr.
Dale Earnhardt Jr. was the 13th recipient of the North Carolina Motorsports Association Achievement in Motorsports Tribute Award presented by Fifth Third Bank. EPARTRADE was one of the sponsors of the event this week. The third-generation NASCAR driver from Kannapolis, N.C., was honored before a crowd of nearly 400, including industry luminaries such as Rick Hendrick, Mike Helton, Steve Phelps, Humpy Wheeler, Kyle Petty and Steve Letarte. Following a video that recapped his career in NASCAR, Earnhardt took center stage. Earnhardt, Hendrick, Helton and Letarte wrapped up the evening by entertaining the crowd with many behind-the-scenes stories from Earnhardt’s career on the race track, in the pits and the television booth. Previous winners of the NCMA Tribute in Motorsports Award are Bill France Jr., Benny Parsons, Richard Petty, Dale Earnhardt, Richard Childress, Junior Johnson, O. Bruton Smith, Wheeler, the Ned Jarrett family, Helton, Jeff Gordon, Roger Penske and Jack Roush. Longtime motorsports reporter Deb Williams, who spent the majority of her career with NASCAR Scene, was recognized with the Jim Hunter Memorial Media Award. Hickory (N.C.) Motor Speedway, the Martin Truex Jr. Foundation, Kooks Headers & Exhaust received three of the four Motorsports Industry Awards, with Truex and longtime companion Sherry Pollax on hand to accept their award. Kevin Piercy accepted the honor for Hickory, while Kooks owner George Kryssing Jr. represented his company. The final Industry Award was shared by Charlotte Motor Speedway and NASCAR in recognition of the first ROVAL event at the nearby state-of-the-art motorsports facility. CMS General Manager Greg Walter and NASCAR President Steve Phelps accepted the honor. Five students were recognized with North Carolina Motorsports Foundation Scholarships. Hamilton Brown Hewitt received the annual Sam Belnavis Scholarship, while Justin Pugh, Ajinkya Khare, Mitchell Lund and Benjamin Chase Carey were NCMF General Scholarship recipients.